The world still needs His love The life and ministry of Christ was marked by His overwhelming compassion for people. And His heart is the same today. As believers, we are called to be the hands and feet of Christ, and extend His extravagant love to a broken world. Based on the book of Luke, this study examines the very heartbeat of our Savior, and explores how Jesus connected with hurting people in an authentic and powerful way. 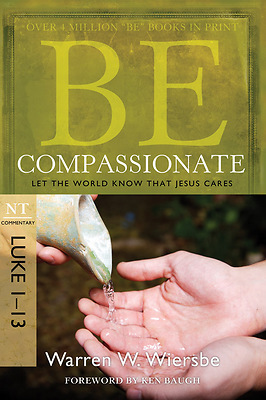 Part of Dr. Warren W. Wiersbe's best-selling "BE" commentary series, BE Compassionate has now been updated with study questions and a new introduction by Ken Baugh. A respected pastor and Bible teacher, Dr. Wiersbe explores the compassionate life of Jesus. Filled with moving examples of Christ's ministry to people of all backgrounds, cultures, and beliefs, this study will inspire you to share His love with the world around you.